New Scouts in your Pack, Troop or Crew? Thank you to all our units and leaders who worked to promote, recruit, and sign-up new members! Your work with your units makes the difference. School Night For Scouting was a little(!) wet, but that hasn’t stopped this group of dedicated volunteers from working to sign-up new Scouts! Why do we care about new members? I know that for me, and I hope for you as well, have seen the positive impact Scouting has had on my friends, my family, and myself. Why wouldn’t I want as many people to benefit from the same program that made such a difference to me? Now is the time to follow-up, welcome and onboard new members and parents. As kids and parents experience their first meeting(s), that first experience makes a huge difference in their decision to join Scouting. Don’t hesitate – submit new Membership Application today! We want every new Scout to experience that feeling of accomplishment and price that comes from rank advancement. 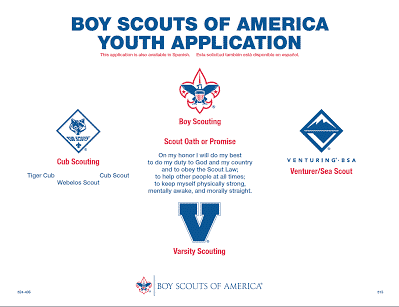 Scouts need to be registered to be able to participate in advancement. We’ll be at roundtable to get applications. Or just call and ask – we’ll make it as easy as we can.